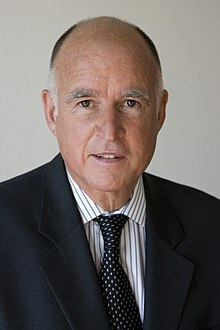 Edmund Gerald "Jerry" Brown Jr. (born April 7, 1938) is an American politician and lawyer who has been serving as the 39th Governor of California since 2011. 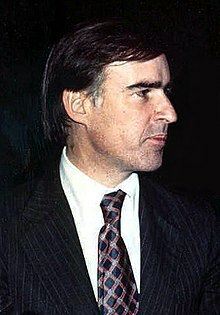 A member of the Democratic Party, Brown previously served as the 34th Governor from 1975 to 1983, and is the longest-serving governor in California history. Prior to and following his first governorship, Brown served in numerous state, local and party positions, including three times a candidate for the Democratic nomination for President of the United States. I've been in office and I've been out of office. And if I were to choose, I'd rather be in office. I'd shrink government in a minute, if I could shrink GM, Bank of America, and all these immoral corporations that operate by an undemocratic code, with no soul and no conscience. The idea that government has some omnipotence or omniscience is completely absurd and counter to all the thinking that went into our country. There is an overblown rhetoric and overblown expectation that if there is a problem there must be program to solve it. Many regulations primarily protect the past, prop up privilege or prevent sensible economic choices. The mistrust of our public institutions and mere anxiety about our future economy are more the order than the exception. Three quarters of the people do not trust their government. More than half of the eligible citizens in California again decided not to vote in the last election. Why? Why the anti-government mood? I asked this same question four years ago and now I believe I understand. Simply put, the citizens are revolting against a decade of political leaders who righteously spoke against inflation and excessive government spending but who in practice pursued the opposite course. In this decade government at all levels has increased spending faster than the true rate of economic growth… The cure for inflation has been administered with a vengeance. Yet most people feel worse, not better, about their government benefactor. The elderly find their fixed income eroding in half; those about to retire fear their future pensions will never keep pace. Ten million California workers see their wages rise but not as fast as prices. Those on welfare obtain larger grants but find more expensive groceries. Government, no less than the individual, must live within limits. It is time to bring our accounts into balance. Government, as exemplar and teacher, must manifest a self-discipline that spreads across the other institutions in our society, so that we can begin to work for the future, not just consume the present. Political Consciousness and Transformative Action. LeapNonprofit.org. League for Earth & Animal Protection (LEAP). Retrieved on 2007-06-12. We are in a degenerate state of self-government. In fact, even to use the words self-government, is not only an exaggeration, it's a lie. It's a big lie! Waldman, Peter (10 August 1999). "Back to Earth: Jerry Brown, the Voice of New-Age Populism, Gets Down to Business". Wall Street Journal. The U.S. incarceration binge is not tied to crime. It's a strategy to control the surplus population in a capitalist system that is breaking down. The Democrats are a big tent with many different points of view. Having said all of that, I think there will be a tendency to passing too many laws and spend too much money. And I would say that the [new] governor is going to have to correct that. But he wouldn’t be able to correct it all because in order to govern he’s got to please some of these groups enough of the time to still be viable as a political leader. That man [Jerry] is like 500 pounds of Jello. The San Francisco Chronicle, unspecified article/page, 6 July 1976. [Jerry Brown] is the most self-serving, inept politician that I have ever met in my 35 years in politics. John Burton, former President Pro Tem of the California State Senate. Los Angeles Times, unspecified article/page, 17 November 1990. Jerry Brown was just a nut. James Carville, All's Fair: Love, War, and Running for President (1994), pp. 89-90. I don't think you can take much of what he says seriously. Bill Clinton, New York Times, unspecified article/page, 16 March 1992. [Jerry Brown is] a desperate man. Hillary Clinton, Los Angeles Times, unspecified article/page, 17 March 1992. He is by an order of magnitude the most self-absorbed politician I have ever dealt with. John Emerson, Brown counsel in 1982 U.S. Senate race. New York Times, unspecified article/page, 2 April 1992. I do not believe he believes what he is saying. John Emerson, New York Times, unspecified article/page, 2 April 1992. I listened, and I've come to the conclusion I just don't trust him. Marcela Howell, former Chair of the National Abortion Rights Action League. The Los Angeles Times, unspecified article/page, 31 January 1989. Jerry has given hypocrisy a bad name. Mickey Kantor, manager of Brown's 1976 Presidential and 1982 U.S. Senate campaigns, Los Angeles Times, unspecified article/page, 17 March 1992. Jerry has no political or ideological anchor. Mickey Kantor, New York Times, unspecified article/page, 30 March 1992. Oftentimes Jerry will run for an office and not want to do the things that are part of that office. Richard Katz, former State Assemblyman, New York Times, unspecified article/page, 2 April 1992. Richard Maullin, Brown's campaign finance director for 1974 Gubernatorial campaign, The San Francisco Chronicle, unspecified article/page, 24 March 1992. Jerry is perceived by most legislators as very selfish. Leo McCarthy, former Lieutenant Governor and Speaker of the California State Assembly, United Press International, unspecified article, unspecified date, 1978. The governor is the worst administrator ever to come down the pike. Lou Papan, former State Assemblyman, The Sacramento Union, unspecified article/page, 26 December 1982. He's very ambitious and will do anything to be in power. Stanley Sheinbaum, former Brown appointee to the University of California Regents, New York Times 2 April 1992. I don't know who Jerry Brown is anymore. There's been so many evolvements. Art Torres, Chairman of the California Democratic Party, The Sacramento Bee, unspecified article/page, 28 March 1998. I don't like to talk about Jerry Brown. I don't like him. Carmen Warshaw, former Democratic National Committee member, New York Times, unspecified article/page, 2 April 1992. I don't think Jerry Brown is committed to anything but Jerry Brown. Shirley Wechsler, former Vice President of Americans for Democratic Action, Penthouse, unspecified article/page, October 1979. This page was last edited on 17 March 2019, at 11:13.